The following originally appeared on 9/10/08 at Exit 51. Don’t you just hate it when you’re making a recipe that you’ve found somewhere, in a book or online, but you don’t know what it’s supposed to look like? I do. And despite my own hatred of it, I find too often that I do it here. There’s nothing worse that being excited to try something new only to get into it and figure out that you have no idea what the end result is supposed to be. Oh sure, you might have a vague idea but don’t those pretty pictures give you clarity? Now I’m not saying that when I make one of these dishes that mine looks exactly like what some food stylist toiled over four hours. But at least I know if I’m heading in the right direction. I could make a million excuses about why some of my recipes don’t have photos. But I won’t. Instead, I’ll show you a pretty picture of what Alt Risotto looks like when I make it. Now that I’ve made this dish a second time, I have a new thought about it. Barley is still a fine substitute for traditional arborrio rice. But barley risotto has a stronger, earthier flavor. At first I thought it was the fancy, schmancy cheese I had used. So this time, I used an ordinary grated parmesan. And while the cheese WAS part of the solution, that earthy flavor was still there. So either this is really what barley tastes like or my chicken broth was to blame. Next time, I’ll be using my Swanson instead of Trader Joe’s. I’m gonna put my vote out there for College Inn if you go with a can. Also, I just wanted to point out that daylight savings time comes to an end next weekend and food bloggers all over the northeast can rejoice! There just might be enough light to photograph dinner! Jennifer, my loyalty pretty much lies with Swanson when it comes to broth. In a perfect world I’d make my own but I don’t have enough freezer space to store it. Maybe in the next kitchen. And yes, I’m looking forward to having natural light make a return to my photos. 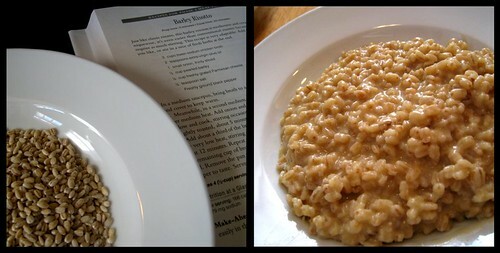 If it makes you feel any better, I tried barley risotto, too. Ick. Kitch, I liked it as a South Beach friendly alternative. But I tried a new broth when I made it and I think that was the part that had me torn. Well, that and the fact that it’s barley.